Experience all the charm of Mexico and its people with Gamma, a hotel concept designed to bring you the warmth and quality of a local hotel during your stay. 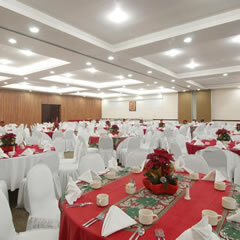 Visit Gamma Pachuca and discover for yourself the magical combination of quality service and charming details. The hotel is located near the entrance to the city and next to Mexico's first golf course. This strategic location offers guests easy access to the most important industrial areas in the state of Hidalgo as well as Pachuca¿s main tourist attractions. Allow us to indulge you with a choice of 114 comfortable guest rooms, spacious gardens, a fitness center, heated indoor pool, restaurant, bar, 24-hour room service, Business Center, and meeting and event rooms. Get a taste of Mexico's delicious cuisine with our dining options which include a breakfast buffet and à la carte lunch and dinner service. We take pride in offering healthy meal options including salads, pastas, sandwiches, fish and more, all served in a relaxed setting by our attentive wait staff. The hotel has a Business Center with computers and high speed wireless Internet, and a meeting rooms with a screen, and capacity for 5 people. It also features 2 meeting rooms that can be adapted to host from 40 up to 400 people in an auditorium; each room has a board, electric screen, flip charts, coffee service and personalized service. Our professional team will help with your groups and conventions. Excellent Hotel - good value for money - Good Staff - Very Friendly - Easy to access - I do recommend it in Pachuca - Great Breakfast and Good quality! We will back for Sure! thank you for Gamma Pachuca Staff! The hotel was very good, they can improve some things. The room was very comfy, bed, and the minisplit was amazing, keep the room warm during the night. the shower was very good because water had a lot of pressure and the temperature was perfect. "Nice. Bathroom could be better." Nice, confortable, clean room with good working silent air conditioning. Good quality mattress. Friendly staff, good service. Pleasant quiet garden view. Shower space could be better. Tiles are worn off. "No air conditioning and lack of smoking area"
They should consider making improvements to have air conditioning units working, refill toiletries daily and accommodate people who wants to smoke to avoid been standing on the street under the rain. Also, the carpets are old and have terrible odor. "Awful service, too expensive compared with their service and their rooms' category." Everything was very slowly, We had to wait more than one hour to get our room, then we decide to wait on the restaurant but also there, they took between 15 or 20 minutes just to take our orders. Our friends' rooms was dirty when they arrived. There is no way you can rest because of the noise of the others rooms and halls. You can hear everything between rooms and the staff cleaning with the vacuum. It's too expensive compared with their service and it looks old. Definitively I will not recommend this hotel to anyone. Look for another option around. This room's charm greets guests as soon as they walk through the door. It features a king bed, 2 dressers, a 32" TV, reading chair, spacious work desk, telephone, and bathroom with a toilet and shower. This comfortable room includes 2 double beds, 2 dressers, a 32" TV, reading chair, spacious work desk, telephone, and bathroom with a toilet and shower. Comfort meets luxury in this spacious suite that boasts intricate wooden decorations and a magnificent view of the golf course. It is made up of one bedroom with a king bed, 32" TV and full bathroom, as well as a living room that includes a 32" TV, direct line telephone, high-speed Internet, fully equipped kitchenette and a half bath. Enjoy the warmth and quality of this spacious suite which features intricate wooden decorations and a magnificent view of the golf course. It is made up of one bedroom with a king bed, 32" TV and full bathroom with a shower and separate bathtub, as well as a living room with a 32" TV, direct line telephone, high-speed Internet, fully equipped kitchenette, and a half bath.